A short drive through the swamps of southern Louisiana typically results in an insect massacre taking place on the front of your car. It’s a constant battle to keep your windshield clear enough to drive during the warmer months. The insects flying around at ground level that both cause great irritation (mosquitos) and provide countless benefits (pollinators) are only a small fraction of the total insects in transit on any given day. Many people are familiar with the North American monarch migration (if not check it out here) but fewer are aware that high in the skies, tiny bugs are constantly on the move. A new study published in Science used some fancy sensing technology to make a first attempt at quantifying just how many bugs are flying above our oblivious heads every day. Insects represent more than half of all known living organisms. The total number of insect species currently living is listed at around 6-10 million with an estimated 2-30 million species undiscovered. With numbers this staggering combined with the relatively small size of most insects, it’s easy to understand why scientists know little about their migratory behavior. Most research up until now has focused on important agricultural pests and insects known to be vectors of infectious diseases. However, advances in sensing technology that reduce the time intensity of sampling and increase detection ability are allowing scientists to gain a much better understanding of insect migratory behavior. A paper published in Science in late 2016 by Hu et al. attempted to quantify just how many insects are participating in long distance migration high above the United Kingdom. The study calculated that annually, a mean of 3.37 trillion insects migrate above the 70,000 km2 study area (an area roughly the same size as the state of Oklahoma) at heights between 200 to 1200 meters (0.1 to 0.75 of a mile) above ground level. This massive number of individuals translates to 3200 tons of biomass per year migrating high in the sky. The biomass of insects migrating across the United Kingdom annually is 7.7 times the weight of all birds migrating between the United Kingdom and Africa every year and more than 40 times the weight of the 150 million monarch butterflies that migrate in North America every year. How did Hu et al. go about estimating this shocking number? The term entomological radars sounds like something out of a sci-fi movie where humans are trying to combat their new enemy, mutant insects that are taking over Earth. Fortunately, entomological radars is just a fancy name for a radar system employed to study insects hundreds of meters up in the air. This technology was first used in the late 1960s to study insect migration of pest species including grasshoppers, locusts, moths, and planthoppers. Findings from these earlier observations confirmed that long distance migrations occur frequently during both daytime and nighttime. A new generation of entomological radars termed vertical-looking entomological radars (VLRs) were used in this most recent study. This newer technology consists of a beam that is shot upward from the ground and as insects pass across the beam, their presence causes echos that are recorded back on the ground at the sensor. The rise and fall of the echo strength corresponds to an insect flying across the beam. The technology is able to determine the height of the flying insect by the strength of the returning echo enabling the development of a height profile of insect abundance. Advances in signal detection and automation have allowed scientists to track directions and speed for specific target size classes of insects with high temporal resolution. This technology allowed Hu et al. to discriminate abundance between medium (10 to 70 mg) and large (70 to 50 mg) insect classes and allowed for observation of directional patterns. The small (<10 mg) insect class cannot be sampled by radar and was instead quantified using aerial netting samples placed 200 m above ground level near one of the VLRs. Hu et al. recorded the migration of insects across the study area from 2000 to 2009 and found some interesting correlations between weather and insect behavior. Migrations were overwhelmingly northward in the spring and southward in the fall. However, during the summer there was no overall trend in the direction of migration. Migration and prevailing wind direction were highly correlated for the medium to large size class indicating the insects’ fascinating ability to detect favorable winds and select these time for migration! The study found that although there were year to year variations in the amount of biomass flowing south and north, the flow in biomass across the ten year period was equal in both directions. Thus, there was no net transport in biomass in either direction over the long term. This study shows that insect migration is a much underappreciated component of global carbon and nutrient transport. This amount of biomass flowing due to insect migration at the planetary scale could have a big impact on global carbon and nutrient budgets. In addition, subtropical and tropical locations are predicted to have an even greater number of high altitude migrants at any given time. 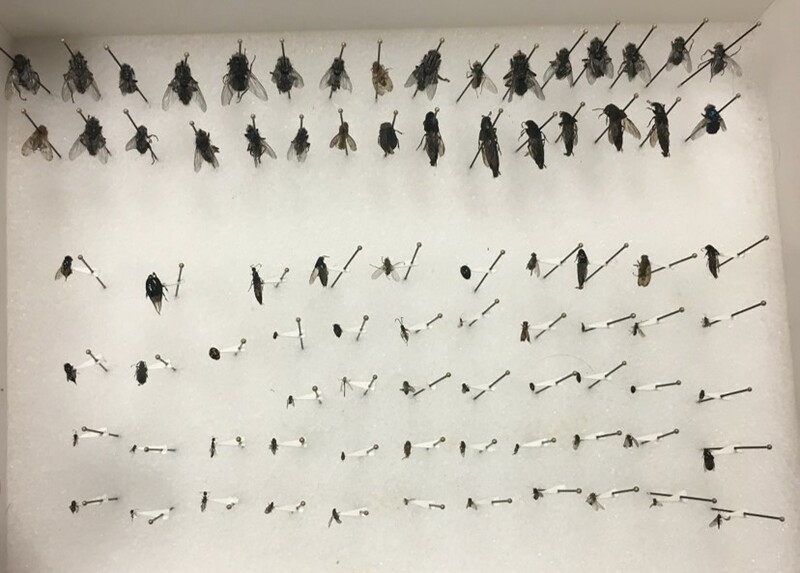 Future research will help scientists gain a better understanding of how important these insect migrations are to energy and nutrient transfer and how climate changes may alter insect migratory behavior.